Netflix returned to AsiaPop Comicon Manila 2018 with its biggest presence in three years - featuring an immersive booth, star-studded panels, global announcements and a special screening of upcoming Netflix film Next Gen - all inspired by and designed especially for Filipino fans. 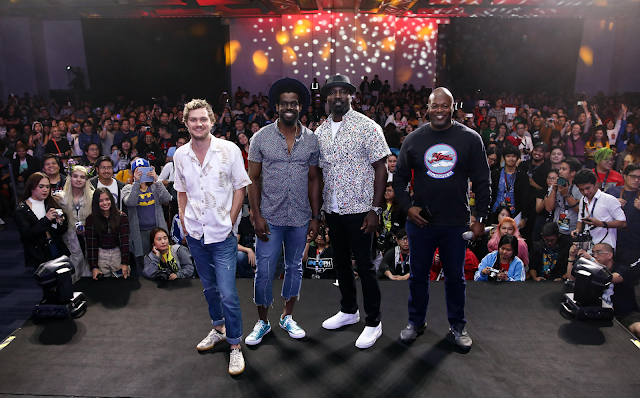 Netflix hosted super-powered panels for over 1000 fans at ‘Hall N’ featuring Marvel’s Luke Cage series star Mike Colter (Luke Cage), joined by showrunner Cheo Hodari Coker, and this season’s villain Mustafa Shakir (Bushmaster). Finn Jones, who stars as Danny Rand/Iron Fist on Marvel’s Iron Fist, joined showrunner Raven Metzner (Sleepy Hollow, Falling Skies) to tease season two of the fan favorite. As part of the NETFLIX❤ANIME panel fans heard from the creatives behind Godzilla: City on the Edge of Battle (TOHO producer Takashi Yoshizawa) and Castlevania co-executive producer Adi Shankar, who debuted the season two trailer of Castlevania. M attended the Hall N session and came out with a happy smile on his face. It seems that fans learned a lot of information from the stars that were there and he got to see the star of Luke Cafe, a Netflix series he has been binge watching for over weeks now.